Two penalties condemned the Hawks to a 2-1 Vanarama National defeat against Hartlepool United at Westleigh Park. Liam Noble gave the visitors a 23rd-minute lead from the spot. Ryan Woodford's 83rd-minute header looked to have rescued a point until Noble decided the game with a last-minute spot-kick. 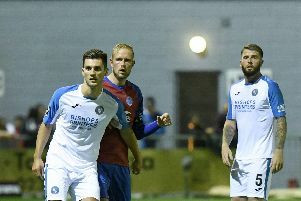 The home side included new signing Ibra Sekajja, a former Crystal Palace and Bognor forward, as a substitute. Ed Harris returned to the starting line-up after recovering from a knee injury. There was also a return for Bradley Tarbuck. The visitors threatened with a quick break on seven minutes with Mark Kitching having a fierce drive charged down. Nicke Kabamba almost nipped in for the Hawks on the edge of the area after a mix-up in the Pool defence. But Pool broke the deadlock in the 24th minute from the penalty spot. A deep free-kick was delivered from the right and Paul Robinson was adjudged to have pulled back Myles Anderson. Liam NOBLE buried his spot-kick into the bottom corner. In response Rory Williams whipped in a dangerous low ball which was cleared from in front of goal. Eight minutes before the break Theo Lewis forced a save from Scott Loach with a far post header. Loach denied a stretching Wes Fogden on the stroke of half-time. Ryan Woodford replaced the injured Jordan Rose in defence at the start of the second half. There was an escape for the Hawks when Carl Magney sent a header narrowly past the post. New boy Sekajja was sent on for his debut in the 73rd minute and Woodford saw his header saved on the goal line. WOODFORD dragged the Hawks level with an 83rd-minute header. Stock delivered a cross and the defender guided his header into the corner. In the dying seconds the Hawks conceded another penalty after a Tarbuck trip. NOBLE made no mistake with the spot-kick.